This part contains the coding sequence for the enzyme Mangaenese Peroxidase (MnP) as well as the secretion tag pelB. Manganese peroxidase is an enzyme from the fungus, Phanerochaete chrysosporium. In this fungus, commonly known as white rot fungus, this enzyme aids in lignin degradation. This enzyme has been shown to degrade nylon 6 and nylon 66. The sequence for MnP in this BioBrick has been codon optimized for E.coli. A pelB secretion tag was also attached to the MnP sequence. It is intended for use by teams that are exploring plastic degradation in their research. Enzymatic activity requires a pH near 4.5 as well as a manganese source such as manganese sulphate. Works best at temperatures near 32 C. Related genes include nylC, nylon hydrolaze, which is also used to degrade nylon plastics. 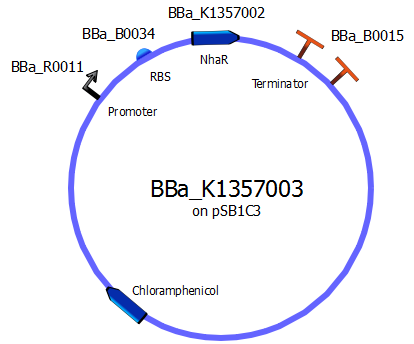 NhaR acts as a transcriptional activator in E. coli. 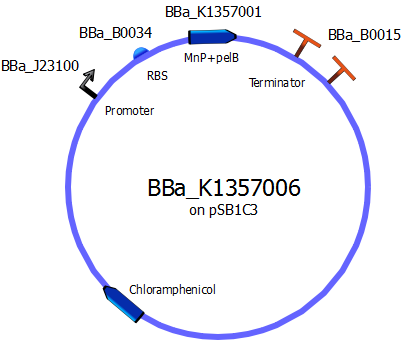 It affects the transcription of the pgaABCD operon which is required for the production of biofilm adhesin poly-β-1,6-N-acetyl-D-glucosamine (PGA). When over-expressed, NhaR is capable of increasing biofilm formation in E. coli. This part is intended to help teams seeking to increase biofilm formation in E. coli in their projects. This construct allows for the controlled overexpression of the NhaR transcriptional activator. NhaR affects the transcription of the pgaABCD operon which is required for the production of biofilm adhesin poly-β-1,6-N-acetyl-D-glucosamine (PGA). This part controls overexpression by utilizing an IPTG inducible promoter. Overexpression of NhaR has been shown to increase biofilm formation in E. coli. This part is intended for use in projects aiming to use or explore biofilm formation. This construct allows for the constitutive overexpression of the NhaR transcriptional activator. NhaR affects the transcription of the pgaABCD operon which is required for the production of biofilm adhesin poly-β-1,6-N-acetyl-D-glucosamine (PGA). Overexpression of NhaR has been shown to increase biofilm formation in E. coli. This part is intended for use in projects aiming to use or explore biofilm formation. Manganese peroxidase (MnP) is an enzyme from the fungus, Phanerochaete chrysosporium. This enzyme has been shown to degrade nylon 6 and nylon 66 (nylon 66 more effectively). MnP helps lignin degradation in Phanerochaete chrysosporium. The sequence for MnP in this BioBrick has been codon optimized for E.coli. A pelB secretion tag was also attached to the MnP sequence. The BioBrick also contains a constitutive promoter, a ribosome binding site and a terminator. This BioBrick allows E.coli to secrete manganese peroxidase into the surrounding environment. It is intended for use by teams that are exploring plastic degradation in their research. Enzymatic activity requires a pH near 4.5 as well as a manganese source such as manganese sulphate. Works best at temperatures near 32 C. Related genes include nylC, nylon hydrolase, which is also used to degrade nylon plastics. 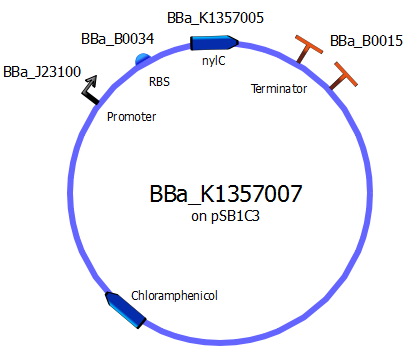 NylC, or 6-aminohexanoate oligomer hydrolase, is a protein isolated from Flavobacterium sp. plasmid pOAD2. This protein was found to hydrolyze nylon-6 oligomers. This part consists of an RBS, the purple chromogenic protein, tsPurple, and a double terminator. This part is intended to serve as a useful reporter to determine what level of expression the system in which it is incorporated into without the need for a fluorescent microscope. 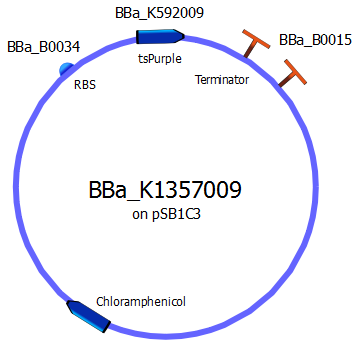 In order to show that a protein encoded on a plasmid will be expressed under desired conditions, a chromogenic change can be observed using this part. Instead of going through the process of using a fluorescent protein that could be costly to visualize for teams with less resources available or in the case that the given fluorescent protein interferes with your desired protein, a team can simply clone this behind their desired to determine expression levels of their desired protein. For use behind part combinations like Promoter+RBS+Coding Sequence. 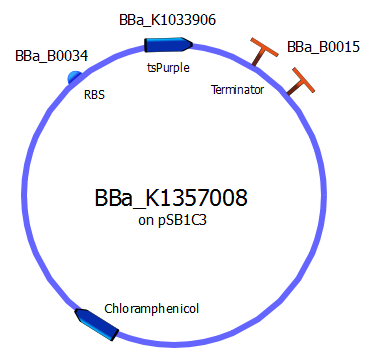 This part consists of an RBS, the blue chromogenic protein, amilCP, and a double terminator. This part is intended to serve as a useful reporter to determine what level of expression the system in which it is incorporated into without the need for a fluorescent microscope. 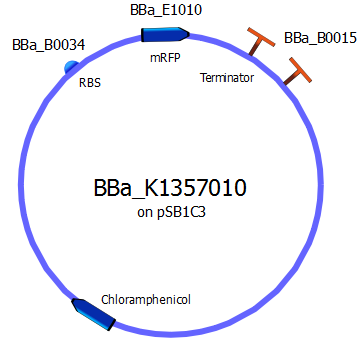 In order to show that a protein encoded on a plasmid will be expressed under desired conditions, a chromogenic change can be observed using this part. Instead of going through the process of using a fluorescent protein that could be costly to visualize for teams with less resources available or in the case that the given fluorescent protein interferes with your desired protein, a team can simply clone this behind their desired to determine expression levels of their desired protein. This part consists of an RBS, the red chromogenic/fluorescent protein, mRFP, and a double terminator. This part is intended to serve as a useful reporter to determine what level of expression the system in which it is incorporated into without the need for a fluorescent microscope. 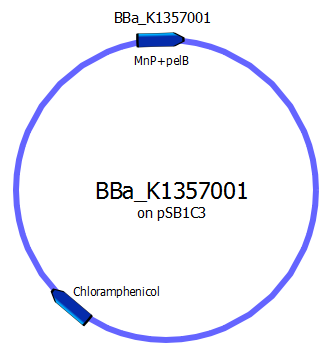 In order to show that a protein encoded on a plasmid will be expressed under desired conditions, a chromogenic change can be observed using this part. Instead of going through the process of using a fluorescent protein that could be costly to visualize for teams with less resources available or in the case that the given fluorescent protein interferes with your desired protein, a team can simply clone this behind their desired to determine expression levels of their desired protein.